Heyning W/D Studio (The Netherlands) stands for the combined work of Wied and Diederik Heyning. Their complementary skills in different disciplines give their pieces in porcelain their unique character. 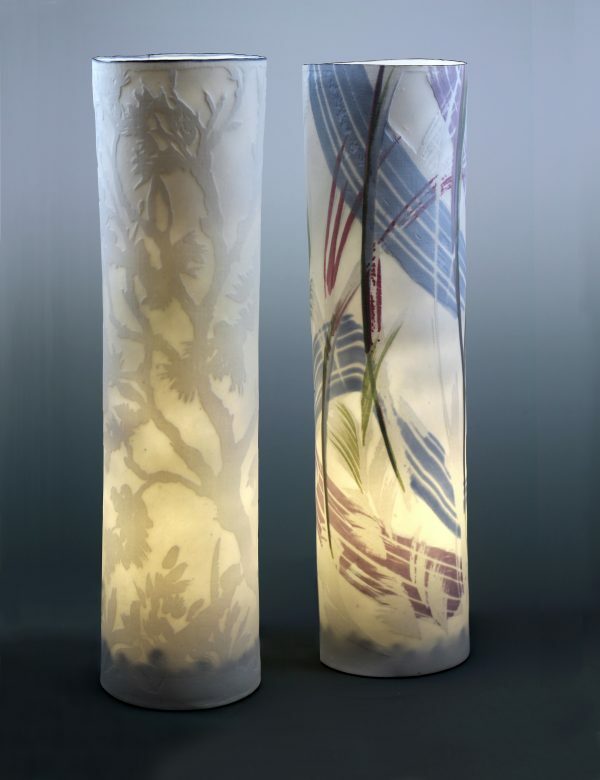 Diederik concentrates on throwing and building paper thin porcelain objects like lamps and vessels, Wied gives an answer to his work by applying fine, delicate decorations in relief. Painting on a three-dimensional object is a challenge. The form is a source of inspiration and leads towards a composition. Image, texture and pattern need to enhance the form. Nature provides endless examples of complementary beauty: perfect harmony of shape and color. In their latest work, the basket series, the light is broken by the open spaces and the shadows cast are part of the work, their delicate expression in contrast to the hardness of the material. Like in traditional lacework the strings of porcelain are put together in a playful way. Their aim is to produce objects that will give pleasure to their owners and users. Generate an emotion, most often by contrast. Contrast between the hardness of the material and softness of texture and form, functionality and shape, light and shade, between delicacy and earthiness.